In order for the ultrasound machine to create an image the systems software must make a number of assumptions. 1. The speed of light is constant. 4. The pulse travels only to the targets that are on the beam access and back to the transducer. There are a number of reasons why deviations from these assumptions occur and the variations around these assumptions give rise to many of the known artefacts associated with ultrasound image creation (Hoskins et al 2003). One of the most common artefacts we come across in clinical practice, is that of anisoptropy. Anisoptropy as a sonographic artefact is described as an ‘angle dependent appearance of tissues’. Fibular tissues, changing from hyper-echoic to hypo-ehoic with increased angle of beam from perpendicular (Jacobson 2007). Artefact is defined as anything made or introduced artificially which misleads the results of an investigation, image or test. A general definition of anisoptropy is ‘the quality of exhibiting properties with different values when measured along axis in different directions (Encyclopaedia Britannica). The transducer transmits an acoustic beam into the soft tissues. The returning echoes are then converted into the ultrasound image. When the wave hits a smooth structure, it is reflected with the angle of incidence = to the angle of reflection (Figure 1). Anisoptropy is a form of reflection artefact observed with highly reflected structures, for example in musculoskeletal ultrasound we might think of tendons as being particularly reflective. As with most artefacts, they are due to the assumption the ultrasound machine makes in order to process the incoming data. If the beam is reflected perfectly, we see a hyperechoic area, or a bright white image. If no beam returns, the machine will produce an image of a hypoechoic (dark or black) area. This has significant relevance when scanning in musculoskeletal ultrasound as just a small angulation of the transducer when scanning highly reflective structures can produce a marked difference in return of reflective beam, i.e. an angulation of the probe through just 2-5º when perpendicular to a highly reflective structure can change the appearance from hyperechoic, bright white, to hypoechoic, dark black. 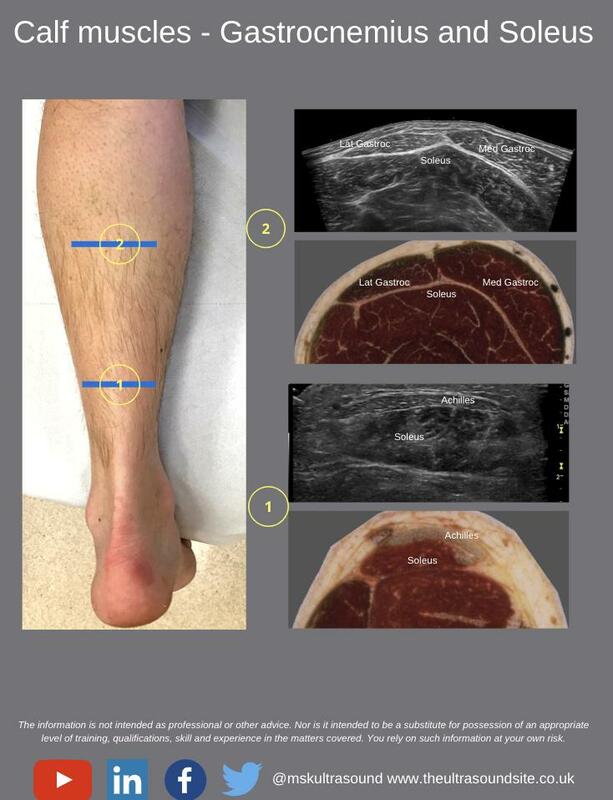 The interpretation of the image may be significantly different, i.e., tendinopathic or even absence of a tendon/tendon rupture, if we are not vigilant of the concept of anisoptropy when scanning. (See the image below demonstrating anisotropy of the patella tendon with alterations in probe angle). Anisoptropy is often apparent on the sonographic evaluation of tendons, ligaments and occasionally some muscles. Abnormal and pathological findings in musculoskeletal ultrasound are often hypoehoic. Therefore anisoptropy is a potential source of false positive sonographic finding (Hendrick 2005, Hoskins 2003). 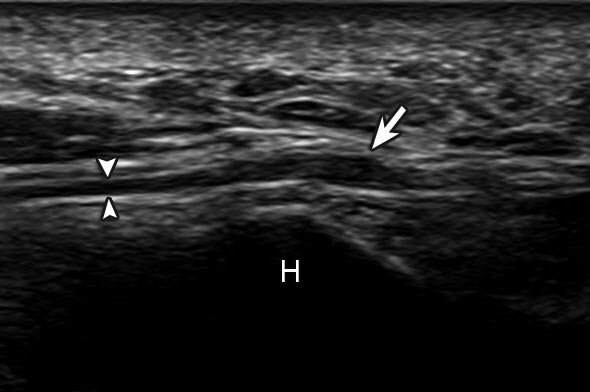 The sonographer must also be aware of the risk of Satisfaction of Search (Pescarini 2006), whereby we might suspect tendon rupture and on the initial observation of perceived tendon rupture or tendon absence, the risk is that the scan might be aborted at this stage, with a confirmation of the clinician’s expectations. It is therefore highly important that the scan procedure is carried out diligently and soft tissue structures are thoroughly interrogated in a way to prove ‘that a better image of the target structure cannot be achieved through angulation and movement of the probe. This obviously requires further time and diligence, as well as clinical awareness by the sonographer. It is this relationship with artefact which is why ultrasound is deemed to be so highly operator dependent. There are instances when scanning a musculoskeletal system, whereby it is not possible to obtain a good image of two structures with the same picture without movement of the probe. An example of this would be imaging of the peroneal tendons on the posterolateral aspect of the ankle, where the tendons travel in slightly different planes. On many people it is not possible to obtain a good image of both tendons, one or other usually appears as hypoechoic due to anisoptropy and thus they have to be scanned separately. Anisoptropy can also be clinically very useful to an experienced clinician and can actually be very useful in helping delineate certain structures. For example, tendons which may have adjacent fat pad can sometimes be difficult to delineate particularly where there may be some tendinopathic changes. However, slight tilting and angulation of the probe will turn the tendon from hyperechoic to hypoechoic when the adjacent fat pad will barely change in appearance. This can be very useful. As stated above, anisoptropy can be a potential pitfall, but also can be extremely useful. It is essential that the machine is checked and maintained regularly for issues such as crystal fallout, use of knobology such as focal zones, time gain control and adjustment of brightness can also be used to manage issues of anisoptropy. Beam steering, can also potentially reduce anisoptropy where this might be desired, particularly scanning structures which travel obliquely, i.e., from superficial to deep and can make it easier to obtain a better longitudinal picture of such structures. Compound imaging also reduces the risk of anisotropy. Key aspects from a sonographer and clinician’s perspective is to be aware of your anatomy, to be aware of the risks of anisotropy, to be diligent with scanning technique and have good technical probe skills to interrogate target tissues. You should always work diligently and thoroughly to obtain the best image one can of the target tissue to obtain the best possible image before making a clinical judgement. Anisoptropy is a reflective artefact. Anisoptropy can be a source of potential pitfall and error when scanning, particularly false positive for pathology. Anisoptropy can be useful to an experienced operator. Awareness and understanding is vital in managing artefact operator and machine related methods. It is why those using ultrasound should be well trained and have an understanding of the physics involved!